Twelve months ago, Bethanie Mattek-Sands was just lifting herself off crutches in Flushing Meadows. Now, she's lifted a US Open trophy - again. 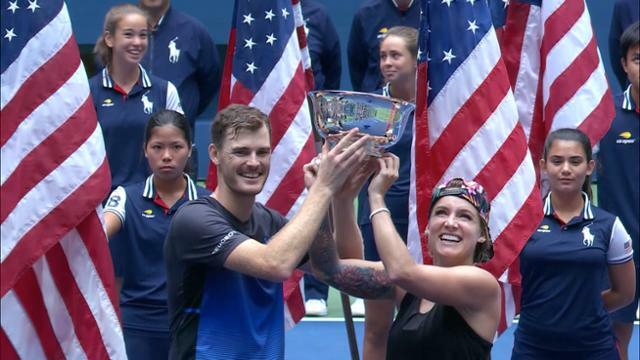 The American won her second career US Open title - and first in mixed doubles - inside Arthur Ashe Stadium on Saturday afternoon alongside Jamie Murray, as the pair defeated Alicja Rosolska and Nikola Mektic in a match tiebreak, 2-6, 6-3, 11-9. Mattek-Sands was previously a US Open champion alongside Lucie Safarova in women's doubles in 2016. "I didn't think about winning a title months ago. I was too far away from that. My win had to be bending my knee from 90 degrees to 95. That had to be good enough. If I thought about holding a US Open trophy last year, I would have been discouraged," Mattek-Sands said after the match. "That's how we got here: it's match by match, point by point. It's how I've gotten here, is taking those little wins every day from last year at Wimbledon and really choosing my attitude. I really had to look at myself in the mirror and decide how I wanted to wake up every day despite my circumstances not being how I envisioned them. "I think I just kept that philosophy throughout my rehab, throughout my comeback. Here I am sitting next to Jamie holding the trophy." Mattek-Sands was in Flushing Meadows a year ago, but in a much different capacity. The American was dabbling in tennis commentary as she began her recovering from a debilitating knee injury that she suffered at Wimbledon. "Last year I was up in the gym here at US Open, and I was practicing walking without my crutches here," she said. "I remember I think it was probably one of my first consistent ones that I was able to walk heel-to-toe up here in the gym." Murray added: "I watched Beth and [her husband] Justin quite a lot, like even last year when I was going to play mixed doubles, some of the doubles matches. They were in the gym together. I mean, you were barely able to do anything, weren't you? I imagine Justin was so patient with the whole process because it's such a difficult thing to go through, I imagine. To be here like a year later is a pretty incredible effort." The fight Mattek-Sands showed to get back on court was evident once she got there this fortnight. She and Murray needed to come from a set down to capture their first Slam title as a team, and also were stretched to a deciding tiebreak in each match from the quarterfinals onward. "It was a little emotional getting that win [in the final]. I thought I did a really good job throughout all the matches, kind of putting that aside and just going out there and playing tennis. I really enjoyed being on the court with Jamie," Mattek-Sands said. "I go out there because I love tennis and I love playing. To hold the trophy in the end, you know, it's amazing. The big win about this and the best part about this was the whole two weeks that we got to play. We really enjoyed ourselves out there, came up with some big wins, played together as a team. That's the reason we're holding this trophy."